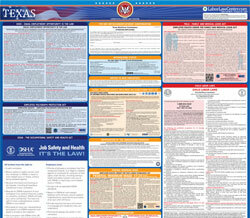 The Texas Unemployment Law and Payday Law is a workers compensation law poster by the Texas Workforce Commission. This poster is mandatory for some employers, including all employers subject to the texas payday law as well as whose employees are entitled to apply for unemployment benefits. This mandatory Texas labor law poster describes the state of Texas' unemployment benefit laws, including the employee's rights if they become unemployed and the employer's responsibilities under Texas law. It appears you don't have a PDF plugin for this browser. Please see the link below to download texas-texas-unemployment-compensation-act-and-texas-payday-law-poster-twc.pdf. unemployment benefit payments. File online at  www.texasworkforce.org or call 1-800-939-6631. Commission office. Commission offices are located in major cities throughout the state. selecting the Account Info tab or by fax at 512-936-3205. To report suspected fraud, waste or abuse of the program call  800-252 -3642.